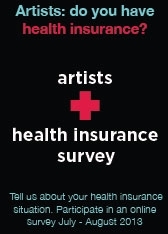 From today until August 31, 2013, Future of Music Coalition, Fractured Atlas and the Artists’ Health Insurance Resource Center (AHIRC) are joining forces with artist service organizations across the country to take the pulse of the artist community regarding access to health insurance via an online survey. Prior research has found that artists of all types — dancers, actors, musicians, visual artists, filmmakers — are less likely to be insured than the general working population. With the rollout of the Affordable Care Act (ACA) this year and next, we want to know: how many artists are presently insured? What are the factors that make it difficult to get insured under current conditions? What are artists’ expectations about the ACA, and will its rollout change their behaviors about health insurance coverage in the future? This is a critical moment to capture some baseline data from US-based artists about your access to health insurance. If you’re an artist of any type, we urge you to take this 10 minute survey. Are you insured? Fantastic. Tell us about if and how you picked your plan, its cost, and how many individuals it covers. Are you uninsured? Take the survey so we can better understand the barriers to coverage. Your participation will be both anonymous and confidential. We’re hoping you can help us spread the word about the survey and encourage your artist friends to participate. This page has some materials that will make it easy to post a message on your website/blog, Facebook or your Twitter feed. We want THOUSANDS of musicians, dancers, filmmakers, actors, visual artists and literary folks to take the survey so we can understand the true scope of the issue in the artist community. And stay tuned for survey results in September 2013.